130 Million Views Rocket Kor’s Surviving the Angel of Death to #1 on Amazon! 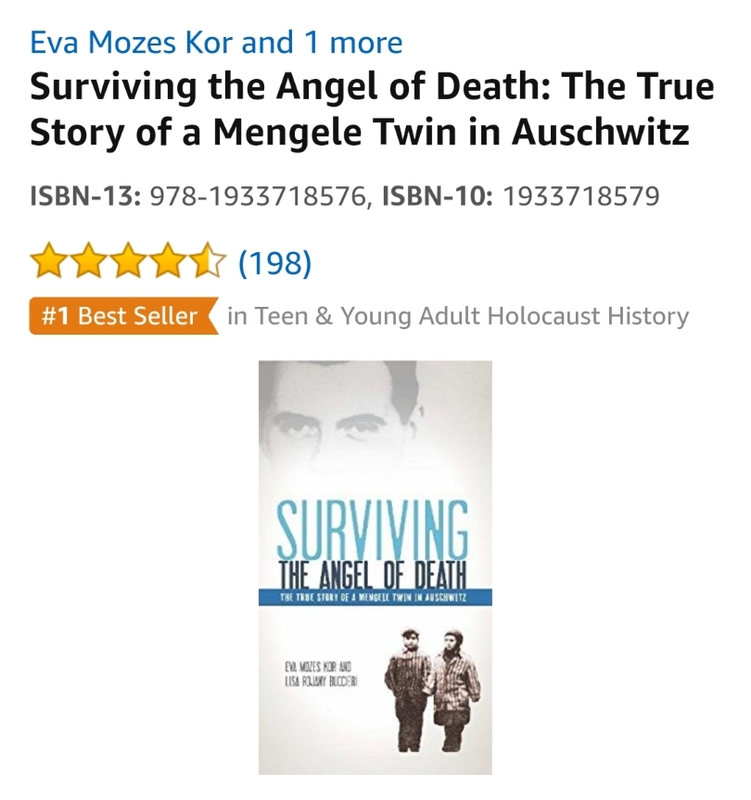 FOR IMMEDIATE RELEASE – Surviving the Angel of Death, the story of Holocaust Survivor Eva Mozes Kor, shot to #1 on Amazon’s Bestseller List for Teen Books about History/Holocaust and Social Issues/Family. This followed an incredible new BuzzFeed interview video with Ms. Kor telling her own horrific Auschwitz experiences during the Holocaust in World War II. The video was posted on BuzzFeed’s Facebook page on September 26th and has gained 130+M views since then, with 1.3M shares and 86K comments, and is still climbing. “CANDLES is pleased that Surviving the Angel of Death is reaching new readers. Eva’s powerful story and life lessons resonate with people around the world.” – Dorothy Chambers, Executive Director, CANDLES Holocaust Museum. Eva Mozes Kor is a recognized speaker, both nationally and internationally, on topics related to the Holocaust, peace and forgiveness, and medical ethics. Through her organization, the CANDLES Holocaust Museum and Education Center, as well as an author for Tanglewood Publishing, her audience has ranged from political leaders to Silicon Valley executives to educators and students of all ages. On the heels of this video sensation, Eva’s true story – Surviving the Angel of Death – will be adopted on both the Idaho and Texas state curriculum lists in 2018, and there will be a new documentary about Eva’s life, a film by Ted Green, Mika Brown, and WFYI Public Media, releasing on April 5, 2018. Eva will be a speaker at the National Council for Social Studies Annual Conference in San Francisco in November 2017. First published in 2009 by Tanglewood Publishing, Surviving the Angel of Death follows 10-year-old Eva Mozes Kor during her harrowing experience in Auschwitz. While her parents and two older sisters were taken to the gas chambers, she and her twin, Miriam, were herded into the care of the man known as the Angel of Death, Dr. Josef Mengele. Subjected to sadistic medical experiments, she was forced to fight daily for her and her twin’s survival. Sold throughout the US and ten other countries, Eva’s incredible true story written for young adults shows readers a child’s endurance and survival in the face of truly extraordinary evil. For more information about the book visit tanglewoodbooks.com. Eva Mozes Kor is an internationally known author, speaker, and social justice advocate. Her harrowing story has been covered by numerous media outlets and is the subject of a documentary, Forgiving Dr. Mengele. In 1995, Eva opened CANDLES Holocaust Museum and Education Center in Terre Haute, Indiana. Find out more about the museum and Eva’s ongoing work at candlesholocaustmuseum.org. Tanglewood Publishing was founded in 2003. An independent publisher based in Indianapolis, Tanglewood boasts a roster of award-winning authors and illustrators. Through humor, adventure, disaster, disappointment, friendship, and love, Tanglewood brings the authentic young reader’s voice to the forefront for an unforgettable page-turning experience, opening up the doors to more adventures rooted in more pages. You can learn more about Tanglewood Publishing at tanglewoodbooks.com.